THE END IS NIGH? The world is not going to end…really. “The Dow is on track to close at a new 52-week (and all-time) high. 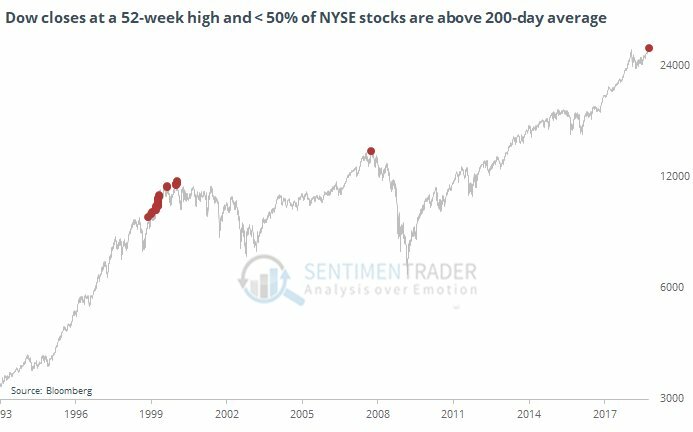 Yet, there are 3 times as many 52-week lows as 52-week highs on the NYSE. Since 1965, that has happened on exactly one* other day. This morning he dropped another stat with a powerful visual. Shhhh…don’t tell anyone, I have a dirty little secret. Are you ready? Are you sure? The world is not going to end…really. Despite lingering trade concerns (see Trump Hits China with Tariffs on $200 Billion in Goods), Elon Musk being sued by the Securities and Exchange Commission (SEC) for tweeting his controversial intentions to take Tesla Inc. (TSLA) private, and Supreme Court nominee, Brett Kavanaugh, facing scandalous sexual assault allegations when he was in high school, life goes on. In the face of these heated headlines, stocks still managed to rise to another record in September (see Another Month, Another Record). For the month, the Dow Jones Industrial Average climbed +1.9% (+7.0% for 2018), the S&P 500 notched a +0.4% gain (+9.0% for 2018), while the hot, tech-laden NASDAQ index cooled modestly by -0.8% after a scorching +17.5% gain for the year. If the world were indeed in the process of ending and we were looking down into the abyss of another severe recession, we most likely would not see the following tangible and objective facts occurring in our economy. Doom-and-gloom, in conjunction with toxic politics, continue to reign supreme over the airwaves. If you want in on a beneficial dirty little secret, you and your investments would be best served by ignoring all of the media noise and realizing the world is not going to end any time soon. SPX Monitoring purposes; Long SPX on 9/27/18 at 2914. Speculative darling from 1999 looking very weak. The only fly in the ointment for the bears is the Transports. They refuse to crack. Most indices haven't broken out of the 8-month channel. There was a false breakout to the upside earlier. It would take another 3 percent down to breach the lower trendline. Some claim it's a rising wedge or ending diagonal, both of which are bearish interpretations. Interest rates are starting another seasonal leg higher into the end-of-year Fed rate hike. 3.4 percent on the 10-year, and 3.7 percent on the 30-year appear likely.